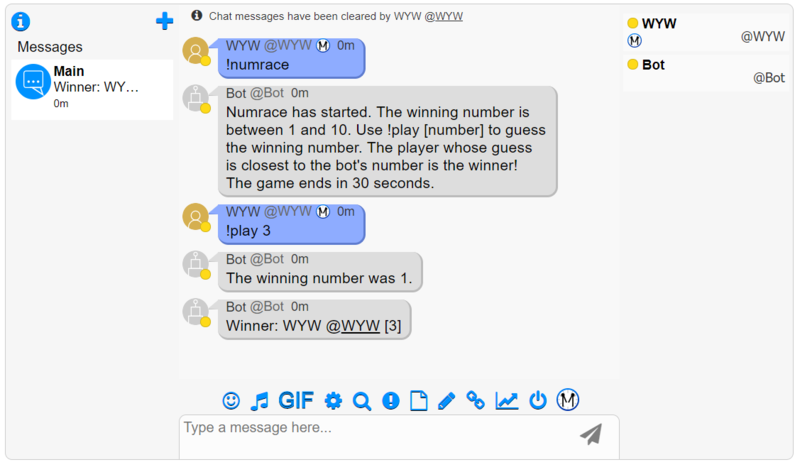 Numrace is a game where users try to guess the winning number. This game can be started via the bot command !numrace. When someone uses !numrace to start the game, the bot will explain the rules below in the first message. By default, the winning number is between 1-10. You can change the range when starting the game by doing !numrace [number between 10-1000000 here]. After 30 seconds, the game ends and the top 3 guesses that are closest to the number are shown. The player whose guess is closest to the bot's number is the winner! Do you have what it takes to win the Numrace? The number guessed must be within range for it to count.